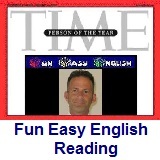 ﻿ Fun Easy English - reading practice and learning about the holiday Abraham Lincoln Birthday. Abraham Lincoln was the sixteenth President of the United States. He is a very popular president especially among younger kids in America. Hi. In the classroom today you will learn about Abraham Lincoln. Today is the birthday of Abraham Lincoln. Abraham Lincoln was born on February 12th, 1809. He was born to Thomas Lincoln and Nancy Hanks, two uneducated farmers. Lincoln was born in a one-room log cabin on a 348-acre farm, in Kentucky. He successfully led the country through the American Civil War. He saved the Union and ending slavery. He was a lawyer, an Illinois state legislator, a member of the United States House of Representatives, and twice an unsuccessful candidate for election to the Senate. Lincoln won the Republican Party nomination in 1860 and was elected president that same year. Lincoln was the first Republican elected to the Presidency. He introduced measures that resulted in the abolition of slavery. He issued his Emancipation Proclamation in 1863 and promoted the passage of the Thirteenth Amendment to the Constitution. His assassination in 1865, by John Wilkes Booth, was the first presidential assassination in United States history. Lincoln has been consistently ranked by scholars as one of the greatest United States Presidents. Abraham Lincoln was the president who fought to free African Americans from slavery during the middle of the 19th century. He is a favorite among Americans, especially kids of elementary school age. 1. Abraham Lincoln was born in what year? 2. Who were Abraham Lincoln's parents? 3. Abraham Lincoln was born in which state? 5. Abraham Lincoln led the country through which war? 6. Abraham Lincoln was against which of the following? 7. Abraham Lincoln was a member of which party? 8. Abraham Lincoln was elected president in which year? 9. Abraham Lincoln issued which of the following in 1863? 10. Who assassinated Abraham Lincoln in 1865?